Most teachers think that students today have a problem paying attention. They seem impatient, easily bored. We might wonder if patience would not come easier to a student who had had the experience of sustaining attention in the face of boredom, and then later finding that patience was rewarded. Arguably, digital immigrants were more likely to have learned this lesson. There were fewer sources of distraction and entertainment, and so we were a bit more likely to hang in there with something a little dull. Roberts gave an example from her own experience. 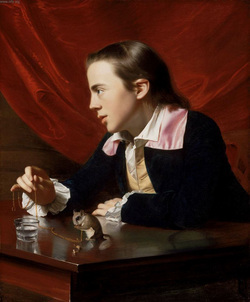 As part of a book she was writing on 18th century American painter John Singleton Copley, she studied at length the painting A Boy With a Flying Squirrel. Although she is, obviously, an extremely experienced observer of art, Roberts noted that it was many minutes before she noticed that the shape of the white ruff on the squirrel matches the shape of the boy’s ear, and is echoed again in the fold of the curtain over his left shoulder.